have some treasures to show. but also for puzzles or games storage. just because it's super cute. we have a few of these and they are so durable, good old Crown Lyn. A couple of cute side plates. A couple of Golden Books for the collection. Haven't seen these before. The Zoo ones especially has cute pictures. I need to give them wash and polish them all up again. And last of all the prettiest sheet I've found for ages. and I'll keep one for backing a quilt. 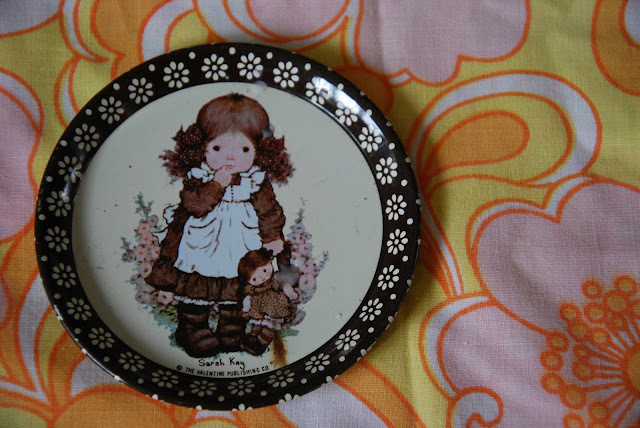 Oh, the little plate for Annie is adorable!! i agree, that and the side plates are my faves of your finds. does it have a name on the base of the side plate with the ribbons/streamers design on it? it looks really familiar, but i can't think where from? great to have a true op-shopping great linking up! I think the two side plates are Poole aren't they? Very collectable! I'm always envious of your opshop successes, the ones up here are always so well picked over. The sheets are totally amazing! I was in my local op shop today and there must have been 40 tins! Must have been someone's beloved collection, but I didn't end up bringing any home with me, strong will power! I love, love, love the teapot! Good idea about storage for puzzles and kids toys. I like the tins, just needed a non baking excuse to bring one home! Side plates are super cute, love the orange fabric too! Ooh lots of interesting things here. Love the sheet especially. Will make a perfect quilt back or sure.